treatment option for replacing missing teeth? Frequently asked Questions about Dental Implants. 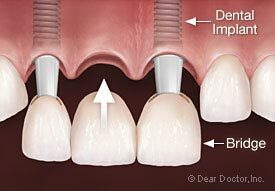 Immediately (at the same time an implant is placed) or after a period of healing, an abutment is attached to the implant. This is a device that “abuts” or joins the implant to a tooth form called a crown, which replaces the tooth part you see in the mouth. It will hold a custom-made crown that the dental laboratory will fabricate and match to your existing teeth. 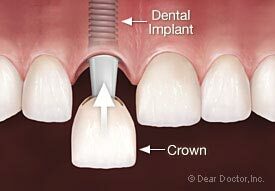 The custom crown is cemented or screwed onto the abutment to permanently keep it in place. Once the crown is in place, it should be indistinguishable from your natural teeth. 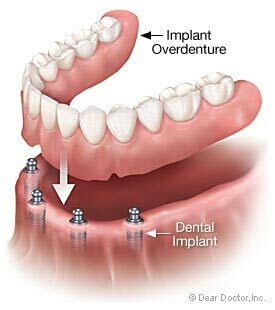 If all of your lower teeth are missing, depending on the design of the removable restoration, two to six implants may be used to support a lower denture. If all of your upper teeth are missing, a minimum of four implants may be used to support an upper denture. Removable dentures are often used to replace extensive tooth, bone and gum-tissue loss, thus providing support for the facial skeleton, lip and cheeks. A new denture can have attachments that snap or clip it into place on the implants or a custom made, milled bar can be fabricated to create additional strength and support for the restoration. Design variations are often related to your bone density and number of implants present; your dentist will discuss these options during your consultation. A significant advantage of a removable denture is facilitating the cleaning of the dental implants. 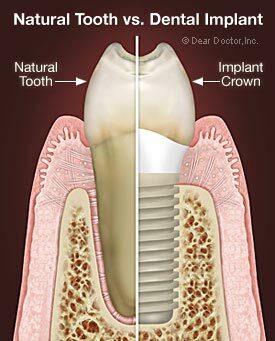 Implant crowns and other prosthetic (false) tooth replacements are made to be remarkably fail safe systems. They are removable and replaceable (only by your dentist), so that if damage or wear necessitates replacement, this can be accomplished without affecting the implant(s) or attachment to the bone.